When I say “The Call of Duty”, I’m not talking about the ever so popular video game, I’m talking about the actual Call of Duty. The Call of Duty is more commonly known as the military service that so many fellow Americans provided for this country as they built up the foundation of America and continue to provide.today. Take a step back in time and read one story about American pioneers, their military experience, and the mark they left in the history book. In the following 1943 letter by a distant cousin, Mary Lee Parker, writes to another distant cousin Hazel Bolton along with some other relatives, Margaret and Richard. In her recollections, Mary Lee describes some of the military experiences of her father, grandfather, and uncle as they migrated west across the great plains of Kansas. Spelling and grammar mistakes are transcribed to help richen the true flavor of these pioneer memories. Sitting by a slightly open window through which I see clouds that cover the sky as they have so many, rany(sp) days through April and May, I direct your thoughts back about eighty years to the time when Aaron Holmes Parker, your Grandfather, Margaret and Richard, and your Great Uncle, Hazel was a boy of seventeen. He had been left in charge for a short time of the quartz mill owned by his father, my Grandfather, who had gone to Denver on business accompanied by and older son Kirk. Grandfather Parker had temporarily left his home in Reading Mass. and lived for a while in Lawrence Kansas where his home had been in connection with the escaping of slaves going to Canada? Then he went on west to Colorado City, a few miles from Colorado Springs. There he established this quartz mill the purpose of which was to crush the quartz making it ready for the process of extracting the minerals. Grandpa and Uncle Kirk had been gone several days when someone brought Papa word that his brother Kirk had joined the Union Army. Papa wanted to go too so he closed the mill and started for Denver. He met Grandpa on the way who permitted him to continue. The reason he was in such a hurry was that he wanted to get in the same compay(sp) with his brother, and he succeeded. He was not eighteen yet but was six feet tall. On account of his height they did not ask his age. He was a member of a Colorado regiment and they were kept in the West to keep the Indians in subjection, so he never met the Confederates in battle. The Indians were disturbing the settlers, stealing their cattle and attacking wagon trains. One time they came upon some Indians just after they had surprised and destroyed one. The soldiers drove away the Indians. They thought at first that all the white people were dead, but after a little a boy raised up. He had been lying quietly because he though(sp) the soldiers were returned Indians. The poor boy had been scalped. He was perfectly conscious while the Indians knife was slashing off his scalp but had grit enough to play dead. When Pap lay sick for so long before he died, this boy, then a middle aged man, visited Wichita and Papa read of it in the Eagle. He wished he was able to go and meet the man and have a talk with him. Papa’s brother Kirk was killed, the only member of his Company to lose his life. It happened out west of here around a hundred miles from Wichita. Of course there was no Wichita then. There is a mamouth(sp) rock rears itsself(sp) out of the otherwise rather level country out there, known as Pawnee Rock. Papa’s Regiment was camped by this Rock. It was early in the morning and they were just about ready to have their breakfast. By-the-way, soldiers they did not have bread to eat, as you have, but “hard-tack” a very hard thick cracker. A few Indians rode in sight. The Colonel sent Papa’s company to capture them. They mounted their horses and were after them. The Indians seemed to have the fastest horses and kept just outside of gunshot distance. But the soldiers had been told to get them so they kept after them. They had traveled miles and miles and had not seen another Indian when suddenly the landscape was full of Indians. They had been hiding in ambush waiting for the soldiers. The Indians greatly outnumbered the soldiers and had the best horses; but the soldiers had the best guns. The Indians did not fight in formation but each Indian would ride near the soldiers, fire, then ride away to reload his gun. The soldiers killed many Indians. Two of the soldiers were half Indian. 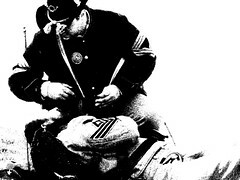 At one an Indian fell near the soldiers. One of these halfbreeds(sp) jumped from his horse ran to the Indian, scalped him and waving the scalp around his head gave a hideous warhoop(sp); then remounted his horse and became civilized again. The soldiers were almost back with the rest of the Regiment when they came to a ravine. It was necessary for them to cross this singlefile(sp). An Indian slipped up and fired at Uncle Kirk. He fell from his horse and the Company stopped. Papa knelt beside him. Uncle gasped “Holmes” and died. The rest of the soldiers wanted to ride on but Papa said he would not go without burrying(sp) Uncle Kirk, so they dug a shallow grave with their bayonets. Hope all is going well with you. I received you(sp) nice letter Hazel. I know you would like to get going. I know it is a thrill for most of the members of the U.S. Army to go journeying and see new places and have new experiences. I saw Lawrence and his wife about three weeks ago. They told me that Alice had gone home. She is still away for I have not been able to get her. I do not know how to call Marion. Do you keep a dai or is it diary? Should think it would be lots of fun to read it later. This entry was posted in Pioneer Life and tagged Pioneer Life by Todd Bryan. Bookmark the permalink. As interesting as I find the history of America and the settlement of the wild west, it saddens me that the pioneer settlers had to fight against their brothers and true settlers of this nation, the Native American Indians.